Below are highlights from selective assignments I have developed at Weber State University. These highlights focus on class projects where students used digital media to delve into literature and literary culture. From studying electronic literature and audio narratives, to creating research projects with online platforms, to analyzing texts using digital tools, my teaching brings media and technology to bear on literary studies, and vice versa. I have taught courses focused on issues of media culture, and I have integrated digital humanities teaching approaches into English courses on subjects including British modernism and literary theory. Projects in all of my classes are process-oriented. I ask students not only to complete the assignment but also to reflect on it, in order to become more conscious users of media in their academic work and beyond. All examples of student work are shared with the students’ permission. Inspired by Gretchen Henderson’s novel Galerie de Difformité, students in this course created “deformances” of texts read in the course, accompanied by critical essays explaining how the transformative choices they made were rooted in their reading of the texts as both literary works and media artifacts. View the gallery. For this assignment, my students collaborated to create an annotated (brief) history of sound. Rather than producing a comprehensive history, our goal was to explore the history of sound as it intersected with technology as well as with literature. Students identified obscure as well as major moments in this history, and they considered some of the ways that sound has impacted literature. 24. A millennial myself, I am aware of the social media usage gap that exists between me and my peers, and the baby boomers and gen x-ers. Students in “Writing for Social Media” produced persuasive essays using Twitter. These essays made arguments about social media, using Twitter’s unique constraints and affordances in order to address and persuade defined audiences. In January of 2015, students in “The Future of Fiction: Literature from Print to Touchscreen” read advance copies of The Familiar: Volume 1, the first installment in Mark Z. Danielewski’s serial novel project. My students participated in an online discussion with students at six other universities in the US and the UK: UC Santa Barbara; UC Davis; University of Notre Dame; Clemson University; University of Tennessee, Knoxville; and De Montfort University. Students also wrote a reflection paper analyzing the experience of reading the text in this unusual way. Students in this course created “deformances” of Gretchen Henderson’s novel Galerie de Difformité, accompanied by critical manifestos. Their projects–including treated books, collage, sculpture, and hypertext–reflected on the book’s status as a literary medium in the digital age. View the gallery. 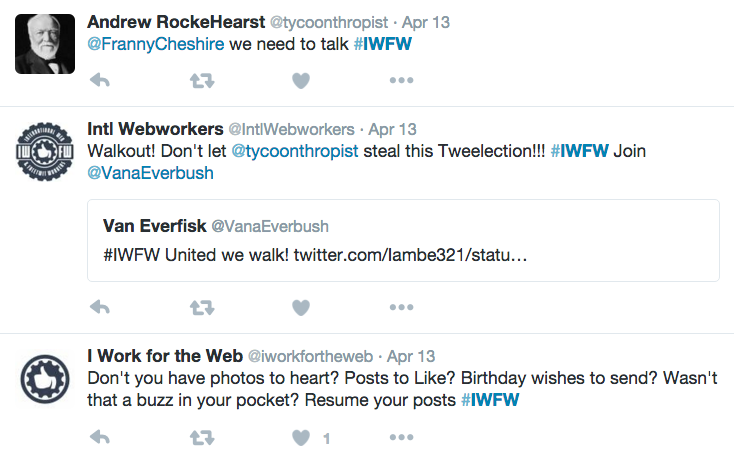 In April of 2015, students in “The Future of Fiction” participated in a “netprov” called “I Work for the Web.” Netprov is a genre of Twitter fiction involving collaboration and improvisation. Read about our involvement in #IWFW here. Students explored the significance of place in British modernism by creating an online map of key locations in the course texts. Students annotated the map with mini-analyses of passages about place. View the map.